In 1991, Germany's chancellor and president agreed to declare the third stanza of their national anthem to appear on soldiers' belts and German coins. Belt buckle reads "Unity, justice and freedom." Note the striking eagle displaying fanned feathers, a symbol of might. 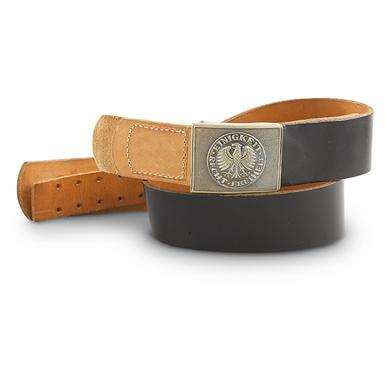 German Military Surplus Black Leather Belt, Used is rated 4.1 out of 5 by 17. Rated 5 out of 5 by Dave from Quality belt Great belt for a holster. Too wide for pants use. Secure, but quick disconnect to remove. It is adjustable to about a 38" to 40" waist. Thick quality leather. Rated 5 out of 5 by richard from Geat price for heavy leather belt SG has fast shipping.! My belt was like new, no marks, very little wear. I can verify that (L) large fits at least a 39 inch waist. I doubt you could ever wear this belt out in civilian use. Rated 4 out of 5 by CHRISTOPHER from Awesome! I should have bought more. Rated 4 out of 5 by GLENN from Not sure if the buclke was exactly new as it had a few minor scratches and a slightly bent flange. But it was definately in next to pristine condition and the belt is wonderful heavy leather. Rated 2 out of 5 by GARY from I is new. Wish I could have had better advise when I called about sizing. Rated 5 out of 5 by RICHARD A from Great belt. Extra-heavy leather...7 adjustment points at 1" intervals for sizing...and a very impressive buckle.